May 15 is Bee Day, and I hope it won't be a D-Day. It's the momentous date that I go to pick up two 3-pound packages of bees to install in my freshly painted hives. I'm excited and infinitely less nervous now that I've joined a local beekeepers’ association. The group offers much needed mentoring, and this weekend I had my first taste of just how valuable that can be. Tony Pisano, one of the seasoned beekeeping veterans of the group who has a passion and generosity for sharing, allowed me and a few other newbies to come and watch him install a few new bee packages into his apiary. Here is a video clip of part of his demo. Sorry for the crazy camera angle! I had read about how to introduce bees to a new hive, but the text came to life and seemed so much easier once I saw it in action. Even better than watching a demo, Tony let me install one of the bee packages myself! I learn best by doing, rather than listening or reading, so this was just a huge help. Tony took this picture of me working the hive. It was a hot day, and I didn't want to get suited up, so I was a bit of a daredevil and showed up in shorts and a tank top. It's not quite as reckless as it sounds, since a new package of bees isn't very defensive. I did happen to get a sting, though, when I squatted down and pinched a bee between my calf and thigh. My fearlessly curious son stands by my side. It was a proud day for me as a mom: we were literally in the midst of a cloud of hundreds if not thousands of bees, and Xavier was calm, cool, and collected. He asked questions and was totally engaged. This is the corner of the hive body. 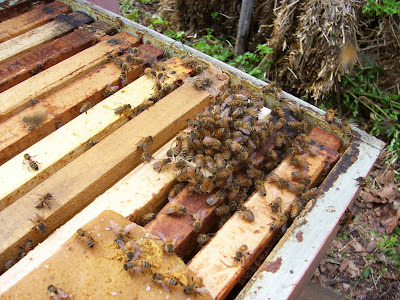 The wooden slats you see are the tops of the hive's frames. Honeybees build comb in those frames and fill some of the cells with honey and other cells with "brood" that will grow up to be new bees. The orange blob is a pollen patty that Tony gives a new hive to start them out so they don't have to do all the heavy lifting themselves right out of the gate. That swarm of bees is covering the queen cage. The queen remains separated from most of the bees for a few days until everyone calms down enough so that they don't kill her, either accidentally or on purpose. A package of bees is not a functioning colony: it's an assortment of bees pulled from different places, and it takes them a while to get to know each other and organize themselves into a well-functioning community. I'll post photos soon of our own hives! I can't wait to see how you do this! I've been saying to my husband that I'd love to try keeping bees. I want a goat too to try making cheese but that's a bit more of a commitment. Do you have a good resource to point me toward making or buying the hives? 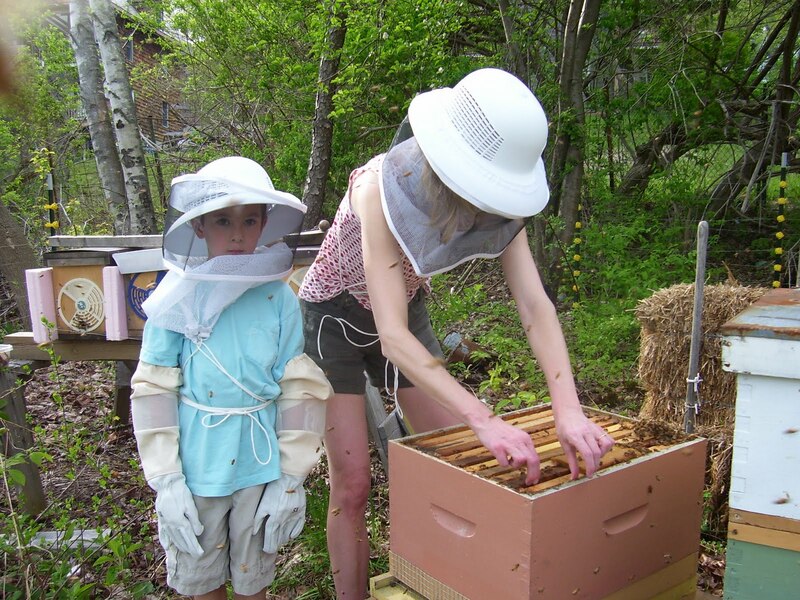 We got our hives and bees at Betterbee in Greenwich, NY...just a hop, skip, and a jump from you! This is awesome. My husband, Paul, is sure to be super envious. It's true - I am super envious! nice work Alethea.